I'm linking up with Clare, for today's 5 things. 1. I am back in my running groove! I was only out of it for a week, but I think the break did my mind and body some good. I've ran 3 days this week, I'll be running again today, and tomorrow will be my long run. My plan is to do 30 miles. It's going to be 57 and sunny. A perfect day to run for hours and hours and hours! 2. A much needed girls night happened last night. 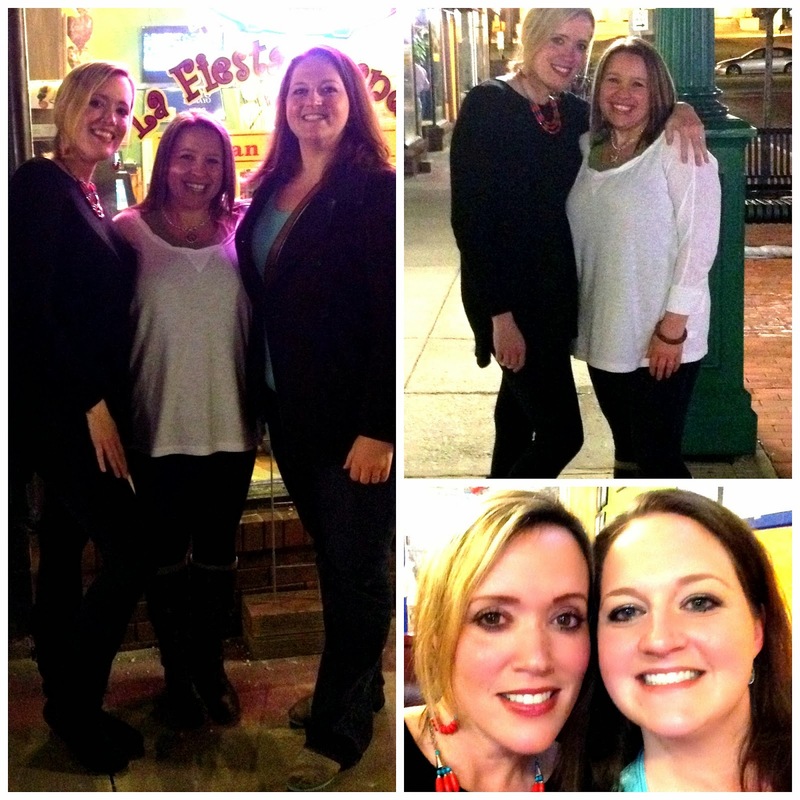 There's nothing like talking and laughing with sweet friends over margarita's and Mexican! 3. I felt like jammin this week. Strawberry jam! I used to make and sell about 15 flavors of jams (to raise funds for our adoption that never happened). I still love doing it, but now I just give them away. 4. My momma. She is so amazing. Although I usually see her once a week, we don't often get a chance to talk alone, so she came to see me yesterday, bringing gifts. Coffee. Yes. This is 7 years old, but it's the only one I have of us together! 5. Well... I guess this should be 4 things Friday, because that's all I got! Your turn! Tell me something random. Love the picture of you and your momma! I want some jam. You can just fax it to me. I make blueberry lemon jam, it is to die for!! Mango jalepeno? That sounds amazing!! Must find that recipe! 30 miles? My legs hurt thinking about it. Random: I'm so excited for the warmer weather... & waiting for more bursts of cold. I don't trust Spring. Believe me, my legs hurt thinking about it too! Lol, I feel the same way. Spring has tricked us too many times, I don't trust it anymore either!! Totally jealous! Really, I'm jealous that he works out with you! I think that's awesome. Those are great things. =) Glad you are back into running. It does the mind and body good! Yes, it sure does. Have a good weekend Betsy!! Thanks Louisa! When I first started spin classes, I had that feeling all the time!! Not fun. Why would anyone drink warm water with lemon?? Ew. I know a lot of mom's who aren't ready for that either. That reminds me, I need to do some push ups, it's been forever. I don't know if I could even do 1 anymore! Lol! I'm going to try and get out for a long run this weekend too, looks like it might be alright around here...but I won't be coming anywhere near 30 miles! Good luck with the run Katie! Hope your long run went well! Thanks Mike!! Good luck on the long run. Thank you Jen! Wow, that's so awesome!! YOU are the rock star!! I hope your run went well! That is a super crazy long run but I know you can do it! It went awesome! I only did 25, but it went great! That jam looks so yummy! I'd love to make my own! You should do it! I love making my own. 30 miles! Wow! I only managed 6 yesterday, but the weather was so gorgeous that if I hadn't had to get home by a certain time, I'm sure I would have kept going for another hour. I hope Spring is here full-time soon!! Great job on your 6! I feel the same way, when the weather is this nice, I feel like I can go for hours! You look just like your Mum! Wow you are quite the runner! Impressed. I am well overdue for a girls night! That is a beautiful pic of you and your mom! You look absolutely stunning! That dress and those flowers...gorgeous! Gorgeous pic of you and your mom!! Congrats on getting your running groove back! Sometimes all you need is a week break! You are getting some rockin runs in lately! Awesome job! Thanks Rhoda! I do think that little break helped.